Fact: Sock Monkeys are adorable. Fiction: A Sock Monkey cannot be altered to become more adorable. We’ve got news for you: everything's cuter with a newborn baby in it. But we don’t need to tell you that, do we? Is there even any room left in your phone’s photo storage? Think about it: baskets of laundry? Ugh. But put in a newborn baby wearing a headband and...ADORABLE! Garden pot of dirt? Meh, so what? 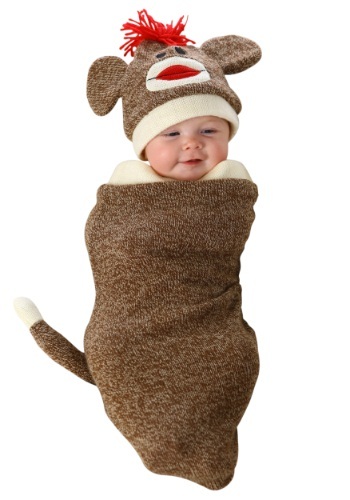 But put in a newborn baby wearing a knit cap and OMG! SO CUTE! Therefore, it is safe to say that while a Sock Monkey is cute in its own right, wrapping up your little baby in this Sock Monkey Newborn Bunting will elevate your bundle of joy to a whole new realm, not to mention the Sock Monkey. This warm and whimsical look is ideal for the newest trick-or-treater in the family--babies 0-3 months--and you don’t even need to tote the laundry basket around all night!